I recently had the chance to try out a Kimco wine bottle cover and am delighted to be able to share these with you just in time for the holiday season! 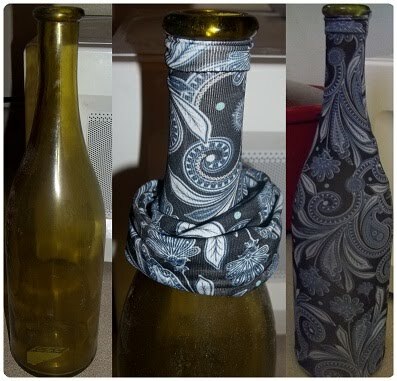 Hailed as: “The New Way to Gift Wrap Wine” these washable, reusable, stylish and affordable bottle covers are able to transform just about any ordinary 750ml bottle of wine into a little piece of art for the table! I received the cover in the color of ‘Pewter Paisley’ but they are available in several other designs to mark the occasion and to suit your flare! I am going to be using this particular cover on a bottle of wine that I will gift over the holiday season – most likely at one of the dinners we shall attend over thanksgiving to give it that extra pizzazz instead of handing over the same old boring bottle of wine. In the mean time, I have taken it upon myself to test the cover out on a decorative bottle I have at home to show you just how wonderful these are and how easy they are to use! I simply started at the neck of the bottle and pulled the cover down over the body and straightened it out to sit with a pretty pattern. Swift and easy to use, the transformation takes just seconds and the re-usability of it makes this a gift that can keep on giving! And, just when you thought it couldn't get any better, it certainly does as these covers come with a full size gift bag and tag to seal the deal! At just $2.99 per cover, these are affordable little delights that you just can’t turn down! If you are interested in learning more about the company that supplies these covers, you can find them at kimcoproducts.com, which is a sister company of Booksox.com/The Turtle Company, where you can find similar covers for other household items such as books and tissue boxes, which also make a very stylish addition to the home!! And here is where it gets exciting! The wonderful people over at Kimco Products have been generous enough to offer 2 of our readers a set of 2 wine bottle covers EACH, which you can use for whichever occasion you choose! All you have to do to enter for a chance to win is to scroll down to the rafflecopter and complete the 3 simple entries! No fuss, no gimmicks - although there IS also a bonus entry for each day you share the tweet for the giveaway on twitter!! What are you waiting for? Go and get those entries in and brighten up those bottles already!! NOTE: This giveaway starts at 00:01am on 10/26/12 and will end on 11/10/12 with TWO (2) winners! The winners will be picked at random via Rafflecopter and each person’s mandatory entry will be verified! The winners will be notified by email of their win (so please make sure you enter with a legitimate account) and will have 48 hours to claim their prize! Mom’s Gone Bronson is NOT responsible for shipping the prize to the winner – this will be shipped directly from the company itself. **Disclaimer: I was not monetarily compensated for this review but I did receive a product for testing. I have not been influenced in any way by the provision of the product and all opinions are my own! Wine bottle covers are intended for use with products that should only be acquired, used, emptied and consumed by adults. Please drink responsibly. I love this idea and it would make a really nice gift. I would give my BFF Donna a bottle of wine. WE both love us some wine! I've got a friend who I'd gift a bottle of wine to in one of these funky covers! They are so cool. What a neat way to dress up a gift! I love the red cover! I love the Pewter Paisley. That is so unique, and beautiful. I love the cover you picked out!! I love the Scarlet Swirl design! There is a Storm Comin'! Joey of New York Beauty is in (and on) the air! BOO! - Time to make those ghosts! FREE Blogger Sign-Up for Kindle Fire Event!